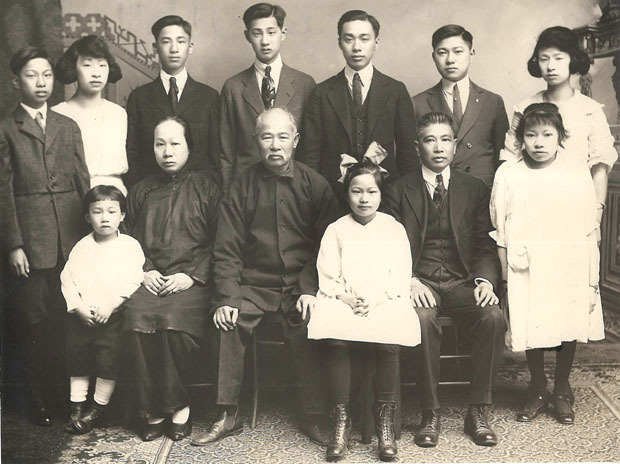 “Portrait of Chung Hing Sou family,” ca. 1920, Chinese Exclusion Act case files, RG 85, National Archives-Seattle, Chung Hing Sou (William) case file, Seattle, Box 1377, Case 41093/4-2. Back Row: Ah Lun (Chung Hing Lun b. 1909), Ah Ming (Chung Yoot Ming or Pansy b. 1902), Ah See (Chung Hing See b. 1907), Ah Hom (Chung Hing Hom b. 1904), Ah Fay (Chung Hing Fay b. 1895), Ah Sou (Chung Hing Sou b. 1893), Ah Ngo (Chung Sou Ngo or Violet Chung, b. 1897). In 1922 Chung Hing Sou was applying for a Native’s Return Certificate. We wanted to visit China, get married, and bring his bride back to his home in Portland, Oregon. 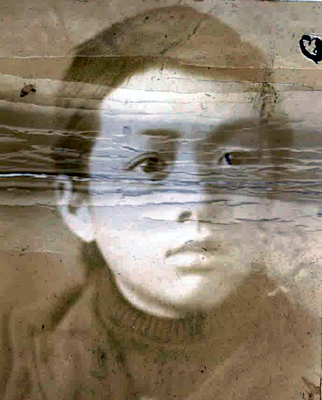 Chung Hing Sou produced a certified copy of his Oregon birth certificate for proof of his citizenship. He was born on 16 August 1893 but the certificate was not filed until 13 October 1921 so he was required to show more evidence of his birth. His parents, several of his siblings and two Caucasian witnesses testified in his favor. Hom Shee, Chung Hing Sou’s mother, age 50, testified that she came to Portland from China as a merchant’s wife when she was 20 years old. 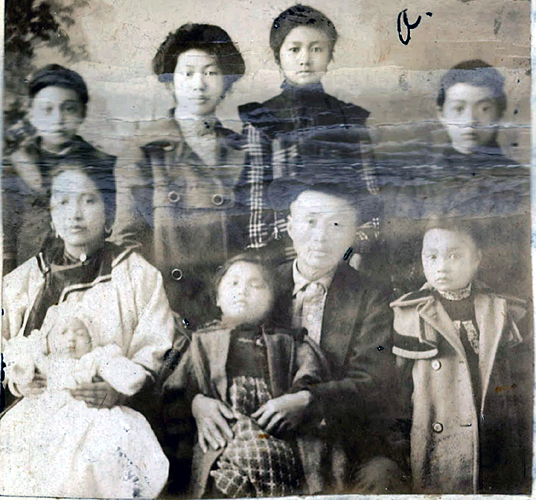 She and Chung Don Poy had eleven children together; ten were living. Chung Don Poy testified that he had been married twice. Ah Joon (Chung Hing June) was his son from his first wife who died in China. Chung Don Poy was a merchant at Yuen Hop Company, Quon Yee Yick Company and the Gum On Wo Company before he retired. Chung Hing Sou was known as William or Willie Chung to White people. As a child he attended Park School (later known as Ladd School). His teachers were Mrs. Sloane and Ella Ross. His report cards were used as proof of his attendance. He lived in Montana for a couple of years and registered for the draft in Flathead County in 1918. He and his brother Chung Fay were supporting the family so they were classified as Class 3B. He was a registered voter and voted in Montana once and two or three times in Portland. William Chung’s half-brother, Chung Hing June, was a farmer in Cherryville, Clackamas County, Oregon. (William or Willie) Chung Hing Sou’s Caucasian witnesses were George W. Wilson, a lawyer, and L. A. Pike. Wilson knew the Chung family for many years. He first met Willie about 1905 after the World’s Fair in Judge O’Day’s office. The family was purchasing a home on Lake Street. Although Willie Chung was a minor, the deed was taken out by him because he was an American citizen. About 1914 Wilson sold a house and lot at 527 Greenwood Avenue to the Chung family and William signed the deed. 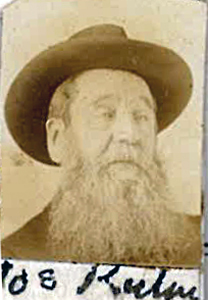 The other Caucasian witness, L.A. Pike, was a Deputy Collector of Customs in Portland and worked for the Customs’ Service for thirty-one years. He was well acquainted with the parents in the family portrait and knew William and most of the other children. H. W. Cunningham, Chinese and Immigrant Inspection recommended that Chung Hing Sou be adjudicated as a genuine native-born citizen of the United States and Chung’s application was favorable recommended by R. Bonham, Inspector in Charge.